Wakefield's in-form prop David Fifita has signed a three-year contract extension after agreeing what the club say is one of the biggest deals in their history. The 29-year-old Tonga international has become a fans' favourite since joining Trinity from Cronulla three years ago and went top of the Steve Prescott Man of Steel leaderboard after a man-of-the-match performance in Wakefield's 30-20 win over Wigan last Friday. "It's great to be here for a number of years," he said. "I just couldn't leave Wakefield. "For what they've given me and what the fans have given me, I just want to give something back to them. My goal now is to bring a trophy to this club. "The bond between the players is something I've never had with any other club. "Everyone comes into one and we're all one group. Whenever we get a new signing, everyone just embraces the culture. "It's what I love about this club and I just can't wait for the journey ahead." 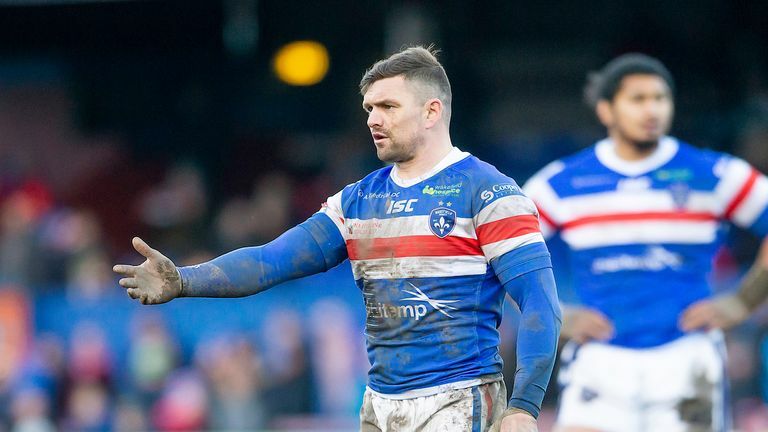 Wakefield chief executive Michael Carter said: "It's fantastic news for the club that we've managed to secure big Dave for another three years. It's a real statement of intent of where we want to be. "I'd say this is one of the biggest deals in the club's history. Dave has been fantastic for us over the last few years and I'm looking forward to seeing him score plenty of tries down the left wing for us in the future." Meanwhile, Wakefield have signed winger Mason Caton-Brown for a second time on a deal until the end of the season and have put him straight into their team for Thursday's Super League derby at Castleford, which is live on Sky Sports Arena. The 25-year-old former London Broncos and Salford threequarter scored 21 tries in 24 appearances in his first spell with Trinity from 2017-18 despite facing stiff competition for a wing spot from Tom Johnstone and Ben Jones-Bishop. Caton-Brown ended the 2018 season with Toronto and has recently been playing rugby union sevens in Hong Kong. Wakefield coach Chris Chester said: "Mason knows what we're all about and we know what Mason is all about. It's a really good fit for the club. "He had two really good years here and we're pleased we've got some competition now in the outside backs and Mason will give us some real quality. "He'll be straight in Thursday. There's no better way to start your second spell than a big local derby against Castleford." Ben Reynolds, recalled from Featherstone, is set to make his debut for Wakefield in the absence of both regular half-backs Jacob Miller and Danny Brough and Chester has also brought back forward Chris Annakin from Dewsbury to help offset the loss of Anthony England with a knee injury. Scrum-half Cory Aston could make his Super League debut for Castleford after being recalled from his loan spell at Newcastle Thunder. He is named in coach Daryl Powell's 19-man squad.